Woohoo. Gng 3.0. Lithunian Zbo. The Gasol's stepbrother. Cant wait for all of the nicknames and monikers as we make another playoff push. Peter Edmiston just announced Mike Conley has formally requested a trade. GTF is ecstatic. "When do I get the opportunity to do what's best for me individually?" 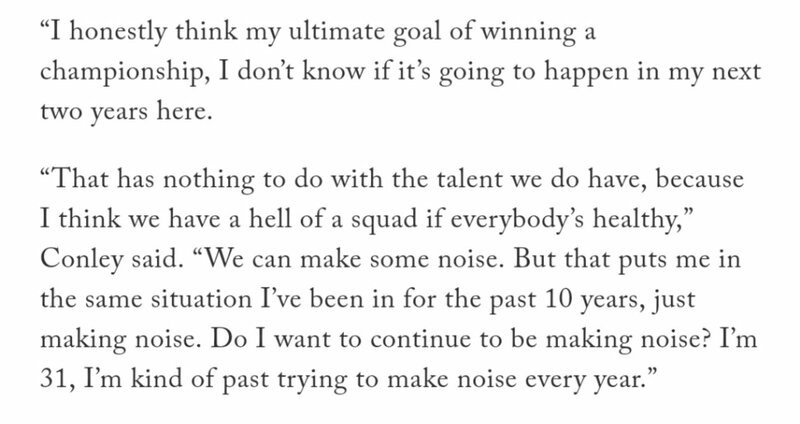 After a career of putting everyone else first, Mike Conley is tired of being overlooked, tired of "just making noise", and ready for his next step. From Peter Edmiston's twitter feed. Yep, like I once said this is why teams typically do not commit to keeping vets around during losing. Its hard to keep them interested. However, not sure what team he truely slides into and makes them an instant contender. So that part will be intruiging. Conveying is so important now! One day Chip you will stop denying my psychic abilities. There is always a spot for you on the 900 line testimonials! Now we can start talking about bringing back Avery Bradley. Because with Conley gone i need another shot creator on the perimeter. Unless Lakers come calling i see Mike heading East. Pera will probably stipulate that Mike goes where he wants. Magic is out in LA. I wonder how that will affect the Lakers ability to make trades? I wonder if the Grizzlies can get lucky twice on trades and quicken the turnaround? I'd sure like to see this team play better after the last two seasons. Just curious what are we trying to achieve with Avery Bradley as our "shot creator" that we "need?" How does retaining a solid vet player hurt a rebuild? Thinking we need to constantly bottom out every season and play nothing but 20yr olds is not a recipe for longterm success. Jaren plus this years pick, Bruno Dillon and whatever pieces we get from Conley trade - counts towards rebuild. Adding Avery, Delon and Jonas isn't going to hurt development of young players. I assume it is a quick playoff run to convey Boston the pick without giving up a lottery pick in the process. More than likely we aren't going to convey this season, correct. Conley wants out and will more than likely be granted that, correct. So next season we should be playing to stay out of bottom 10 slots in order to convey. We will need actual NBA players to do that. Not many vets are lining up to play for a non-playoff team with no money. In summary we are trying to 'achieve' the convey next season. It was either going to be no Conley or no Bradley. There was never any discussion of them both returning. Avery Bradley, Jonas and Delon isn’t the answer to anything. Bradley can take a 1 year deal and that’s it.